Best Dog Food Delivery Service 2019: PetFlow vs Chewy vs Amazon Etc. You come home from a long day at work only to realize you forgot to pick up dog food on the way home. As pet parents, we’ve all been there. But there’s an easy way to keep your home stocked with the dog food of your choice. Whether you’re looking for fresh dog food meals, all-natural kibble or traditional dog food, we’ve got you covered. See which best dog food delivery services we’ve discovered for any need you have. With so many different types of dog food delivery services, it’s impossible to choose a single winner. So we’ve chosen winners in several categories based on the kind of dog food you’re looking for. One thing to note, particularly for the fresh, homemade and natural options — while these are pricier, you don’t necessarily have to switch your food 100% to that option as some suggest. Our dogs, for instance, continue to eat a half portion of their traditional dried dog food (the crunching of which can help rid teeth of plaque), and we mix in half a portion of fresh dog food so they get the benefits of both. Boy do they love this combo! 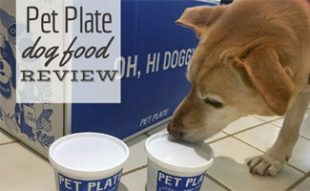 Our pick for the best custom homemade dog food delivery service is Pet Plate. In early December 2016, Renaldo Webb pitched his company, Pet Plate, to Shark Tank in search of funding to expand his promising homemade pet food subscription business. At the time he had 105 customers within a 300-mile radius of New York City. He didn’t get the Shark Tank nod, but he didn’t let that hold him back. Fast forward a year — Pet Plate now has thousands of customers and delivers to all 48 contiguous U.S. states. Pet Plate offers a 50% off discount on your first pet food box. The following price* is based on the profile of a mixed-breed male, 7 years old, 24 pounds, healthy size, no health problems or allergies. Is your pup a fan of dry dog food, but doesn’t handle the big commercial brands well? “I and love and you” could be a healthier, affordable and convenient option. Unlike Pet Plate, this dog food delivery isn’t on a subscription basis. You buy the amount you want when you want (or sign up for Subscribe & Save via Amazon to get it on a regular schedule). Their all-natural kibble, wet and raw dog food, and other food and treat options, are totally grain-free and designed to alleviate digestive and food sensitivity issues. P.S. For anyone who loves The Avett Brothers as much as we do, this dog food brand is named after them! The founder is a big fan. Learn more about this company in our interview with their Digital Marketing Manager. PetFlow is our pick for the best place to buy dog food online if you’re looking for commercial brand pet food at affordable prices. PetFlow offers one-time purchases, or you can set up for auto-ship (anywhere from 2-16 weeks). They carry more than 100 different brands of food, treats, toys and accessories for dogs and cats. Popular brands include Blue Buffalo, Fromm, Natural Balance and more. Their specialists can help you choose the best food brand for your dog, whether you need anything from allergy-free food to a prescription diet. And for every purchase you make, they donate a bowl of food to a companion animal in need. Below we’ve reviewed several other popular pet food delivery options for your consideration. What can’t you get from Amazon? Yes, the online retail giant offers recurring dog food delivery through its Subscribe and Save program. Amazon carries hundreds of dog food brands, treats, health supplies, toys, accessories and more. And they have plenty of options for all types of health concerns. By signing up for their recurring delivery, you can save 5-10% on your purchase. And you can opt for delivery every 1, 2, 3, 4, 5 or 6 months. Chewy has been the king of online retail pet food for the last couple of years and is similar to PetFlow and Amazon in the products they offer and recurring delivery options. But since its acquisition by PetSmart in early 2017, Chewy has had several top pet food brands sever ties with their cyber shelves, most notably Fromm and Champion PetFoods. PETA warns against using Chewy now if you’re animal rights conscious — Chewy’s new owner, PetSmart, has a questionable reputation in selling animals bred and distributed by cruel suppliers. 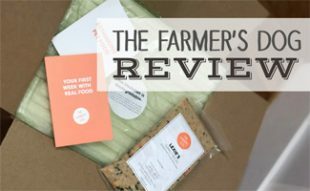 The Farmer’s Dog provides fresh, natural, human-grade food delivered to your doorstep. How does it work? You start by filling out a brief profile of your pup, which includes age, breed, weight, body shape, activity level, health issues and more. This profile allows them to customize your dog food’s ingredients and portion sizes. 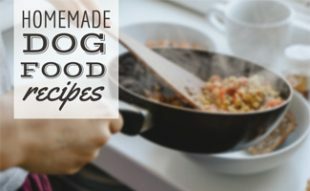 They offer three recipe varieties, including turkey, beef, and chicken, that are pre-made and pre-portioned based on your dog’s profile. All food is human-grade, and each AAFCO-approved recipe comes packed with fruits, vegetables, lentils, fish oil and a blend of vitamins and minerals. The Farmer’s Dog bases its pricing on your dog’s age, weight, and other factors. Smaller dogs start at less than $3/day. The following price* is based on the profile of a mixed-breed male, 7 years old, 24 pounds, healthy size, no health problems or allergies. Our readers have access to save 50% off your first order of The Farmer's Dog, just use this link and the discount will be applied! Lesser-known JustFoodForDogs (JFFD) is another service that prepares human-grade, all-natural food for dogs. In business since 2010, JFFD delivers nationally and offers six healthy recipes. When you sign up for a subscription, they ask you if your dog has any allergies or other health problems to determine the best customized recipes. JFFD has USDA-approved kitchens in Pet Food Express stores in California. And in May 2018, the company announced a new partnership with Petco to build JFFD-branded kitchens in some of its stores. JustFoodForDogs offers a 30-day satisfaction guarantee. The following price* is based on the profile of a mixed-breed male, 7 years old, 24 pounds, healthy size, no health problems or allergies. 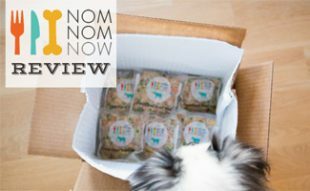 NomNomNow is another fantastic choice for pet food delivery if you’re looking for fresh, human-grade meals. The dog version of this service has a wide variety of recipes — Beef, Turkey, Chicken or Pork. But they are also the only fresh food option we reviewed that also offers cat food. NomNomNow also offers a Care-Grade Guarantee — they’ll buy your pet’s next diet (up to $50) if you don’t see a difference in your pet after 30 days on their diet. NomNomNow is on the pricey side, but they offer excellent customization options for mixing recipes in your box, altering portion sizes and delivery frequency. NomNomNow could be the perfect option for your dog or cat. Be sure to check out our interview with NomNomNow’s Chief Nutrition Officer. Ollie is another homemade dog food delivery service, very similar to The Farmer’s Dog. Ollie works with specialized veterinarians to formulate their AAFCO-approved recipes. They offer four recipe choices (beef, turkey, chicken and lamb), all of which include high-quality proteins, fresh produce, and healthy oils, vitamins and minerals. You set up your dog’s profile (age, weight, breed, etc.) like other box subscriptions. The big difference is that The Farmer’s Dog allows you to include any health concern, such as diabetes or digestive problems, in your dog’s profile. Ollie only takes allergies into account for their customized meals. Ollie gives you 20% off your first pet food box. The following prices* are based on the profile of a mixed-breed, male, 7 years old, 24 pounds, healthy size, no allergies. Video: Why Dog Food Delivery? Watch this video to learn why your pup will drool over dog food delivery services. Want More Info About Dog Food Deliveries? There are many auto-shipping dog delivery boxes available on the market, whether you’re looking for unique treats or toys. They’re a huge time-saver if you don’t have time to shop for your pup. Be sure to check out our reviews of the best dog subscription boxes to learn more. And if you’re wondering how auto-shipping can benefit you, read our article about the pros and cons of auto-shipping. Would having dog food delivered save you time and effort? I have been a customer of chewy for the past 4 years and receive an auto-ship once a month in the rare occurrence that I have received dented cat food cans I simply called spoke to the person who answered the phone and the following day I received replacement for the case that has dented cans. I have never had to speak to more than one person and I have never had a problem having a product replaced I feed wellness no grain canned cat food to my cats into 12.6 Oz cans I called mid-month one time and order just a single case and I explained to the woman on the phone that I was on Social Security and that it was extremely hard to pay for my cat food sometimes she sent me an extra case of wellness which is approximately $32 and a sample case of some blue Buffalo cat food both for free. Chewy is a big disappointment in the customer service department. I called regarding ripped open/damaged items received – they put on unnecessary lid on already plastic wrapped cases of pet food – further free advertising, I guess – environmentally not a good idea, etc. They tell you what you want to hear- like they’re reading a cue card, then don’t do anything to resolve the problem. Instead you get passed around so you’re like going around in circles. Back and forth. Needless to say, I won’t be giving the thousands I spend a year on pet food to Chewy anymore. Disappointed in Chewy…delivery was stolen but there was no confirmation that the delivery had occurred, which would have been helpful. They send spam every day, why not a delivery confirmation? Lots of confusion re-instating the order. I’ve canceled auto ship. Nice overview. Needs a little more research though regarding the viability of Petflow. Petflow is owned by Phillips Feed Company. They have a specific announcement on their web site that since acquiring Petflow, they do not wish to grow the direct to consumer business. What does that mean for the consumer? “. . . While PetFlow will continue to serve its existing customers, we want to be clear: we are not seeking to grow a business directly with consumers. PetFlow has about 140,000 customers today, which represents about 3 people per zip code. By our estimates, local pet stores have more than 150 customers in any given zip code, and we want to help you grow that number.” Prices are good, but at what point will they stop direct to consumer sales?